Which one will give you the data and feedback you need to build a better business? Which one will attract more of the ideal customers you actually want? The unsatisfying answer is both. Surveys and reviews depend on customer engagement. They both offer qualitative and quantitative feedback. Doesn't this mean they're interchangeable then? That you can use one or the other to achieve the results you want? Surveys and online reviews are an essential part of your marketing toolbox. But that doesn't mean it's a good idea to use these tools interchangeably. How should these tools be used, and when? This is all pretty obvious though, right? Here's where things get dicey. Treat customer reviews like a quantitative survey tool and you'll end up using the wrong data to make terrible decisions. What if you use surveys instead of reviews? You know, to avoid the fallout from a negative review. Do that and you miss out on building trust and loyalty with your customers. This still doesn't tell us much about when to pursue reviews and surveys. 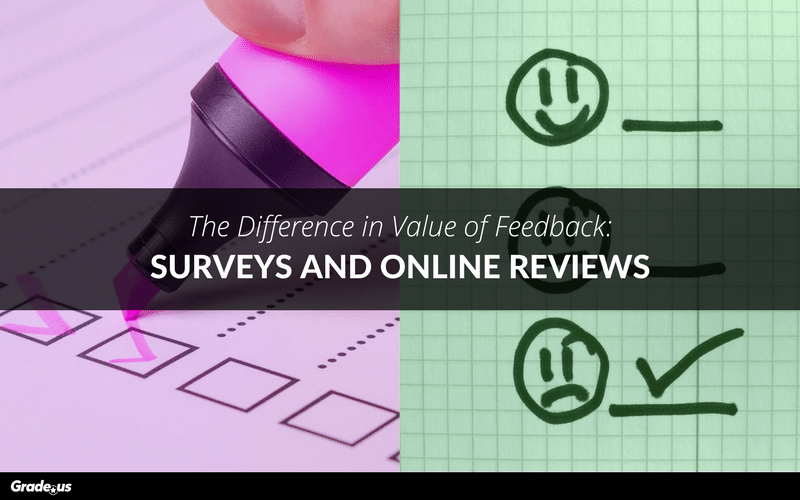 To answer that question we need to understand the benefits of reviews and surveys. Most people view surveys as independent tools. Best case scenario, they're treated as separate items to be used for separate purposes. Worst case scenario, they're used inappropriately or used at the wrong time. What specifically are the benefits to using surveys and reviews? · Inexpensive. Using free tools like Google Forms, you can create an online review for free. Get your survey in front of the right people and you'll have access to all the data you can handle. · Convenient. You can send customers a link to your survey via email, social media, sms and even fax. It's easy and accessible for customers so this means they're far more likely to give you an answer. · Statistically significant. It's relatively simple to accumulate a statistically significant amount of results. That's important if future decisions will be based on survey results. · Precise. You'll have no trouble getting precise, high quality answers from your customers as long as your survey is standardized and you avoid the usual mistakes (e.g. leading, loaded and double-barreled questions, etc.). And, the downsides to surveys? They're typically for internal use only. Your customers are far more likely to tell you what you want to hear. Make a few common mistakes with your surveys and the data you collect is useless. · Publicly visible. This is a two-edged sword. Fantastic if you have lots of positive reviews. A disaster if negative reviews start trickling in. · Authentic peer recommendations. There's a look and feel to authenticity. When customers share their experience with others in their own words, other customers respond. This authenticity includes elements like intelligence, personality and clarity. But it's also a driving force behind a compelling review. · Credibility boosters. Online reviews boost earned, reputed, presumed and surface credibility. That's a huge benefit because it means customers perceive you as less of a psychological risk. · Free advertising. A positive review shared on Facebook is visible to the people in their network. Businesses that are repeatedly mentioned (positively) in reviews receive better rankings and more traffic from Google. Positive word of mouth draws more customers in. What about the downsides? Negative reviews can do significant harm to your business. Online reviews are susceptible to internet mobs. If you, an employee or your business decides to take an unpopular stand on a hot button issue the internet will respond harshly. The benefits are pretty obvious, right? What about the hidden benefits, the ones most of us miss? 1. Surveys and reviews work best when they're used together. Believe it or not, these tools complement each other beautifully. 2. Surveys compensate for the weaknesses in reviews and vice versa. For example, reviews provide more qualitative data and they're highly visible. Surveys can be used to acquire both qualitative and quantitative data, but they're not as visible. 3. Surveys and reviews create leverage. Surveys and reviews can be combined with other strategies and tactics in a way that creates leverage (more on that later) creating an indefinite 1+1=3 scenario. 4. Reviews expose survey data. Your reviews can guide the direction of your surveys. Armed with survey data, you can improve the clarity and focus of the customer reviews you receive. These benefits aren't as obvious, but they're arguably more valuable than the traditional benefits we seek out with our surveys and reviews. Let's look at a semi-hypothetical example. A local restaurant, located in Boston, MA. This restaurant serves pizza, wings, sandwiches, etc. They're known for providing customers with really bad service. Here, see for yourself. Okay, well maybe it's just these two people and this restaurant's having a rough night. This restaurant receives poor marks on other review sites as well. This is devastating. They need to do something fast if they want to stay in business. Step 1: Inventory their reviews. Make a list of all the problems and frustrations mentioned by customers in their reviews. Make a note of each customer so they can be contacted later. Step 2: Create a survey. Their survey questions will give them a comprehensive view of the damage. Can they recover? Which specific employees are creating these problems? How do they change their policies and procedures so delivery drivers are on time? What do customers specifically hate about the food? Why do some of our customers continue to buy? Step 3: Reach out to angry customers. Ask if they're willing to talk on the phone. Angry customers tend to give honest feedback. This business owner should prepare for their feedback to be slathered in abuse and toxicity. These former customers will probably want to give them a piece of their mind. If they're smart, they'll empathize with these customers. Step 4: Ask for a chance. "What can I do to make this right?" This simple question is key. This shows their customers that they're (a.) serious about making a change for the better and (b.) it gives them peace and closure. This isn't about manipulating them to change their review. Making it right shouldn't involve them spending money in anyway. That sounds like common sense until you realize that many companies make their problems worse by doing this. Step 5: Go above and beyond. This depends primarily on the character of their customers. If their request is reasonable go above and beyond. They should do what it takes to repair and restore the relationship, even if it's expensive and painful. On the other hand, if their customer makes a predatory demand it may be wise to move on. Step 6: Tell customers what you did. Give customers evidence showing that their advice was followed. Apologize again then leave management contact information. If something goes wrong in the future they'll have the point-of-contact they need to resolve things peacefully. If they accept your card it may mean that the bridge hasn't been burned completely. Here's the beautiful part about using reviews and surveys together. It's a helpful tool you can use to generate the results you want, regardless of the situation. Here's a few more ways you can use reviews and surveys together. A customer shares a positive online review. You schedule a (phone, email or face-to-face) meeting. You use your survey questions to draw out an amazing review. With your customer’s permission you save this interaction (audio, video, email). You add these video reviews to your retargeting and social media campaigns. Sales conversions shoot through the roof. You use these video reviews as bait pieces to attract even more reviews. Willing customers answer survey questions, essentially creating more reviews. Your sales conversions continue to climb. You can add a one question review to your pop-ups and welcome mats. You can target new subscribers, followers and fans. You can use new survey questions to create more reviews. You can use reviews to create new survey questions! It's a simple yet systematic way to build a wonderful business. Then again, why would you? There's a time and place for these things. When you're looking to create social proof, build trust and make yourself visible, rely on reviews. If you're looking for data, depth and statistical significance, use surveys. Surveys are for assessments, reviews for experiences. There's some overlap of course. But survey and reviews don't have to apply to every situation. Just the right situations. When they're used at the wrong time. Want to build a better business? Looking for a way to attract more of the ideal customers you want? Surveys and reviews are the complementary tools you need to get the data you need. Use both to build a better business.